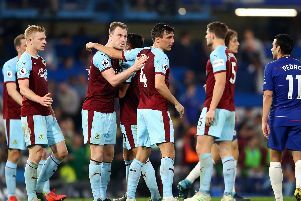 While all England hopes a World Cup semi-final can be just the beginning, not the end, Clarets boss Sean Dyche sees no reason why his players can’t be a part of a bright future. Gareth Southgate’s Three Lions just fell short on Wednesday night, beaten in extra time by Croatia in Moscow, after taking the lead through a free kick from former Claret Kieran Trippier’s first goal for his country. Nick Pope was part of the 23-man squad, without making an appearance, while Tom Heaton and James Tarkowski were both on the standby list ahead of the tournament. Jack Cork also featured in the buold-up to Russia, making his debut against Germany as a late substitute in November, and Ben Mee is widely considered to have been unlucky not to have had a call up to date. And Dyche said: “It seems to me Gareth is quite strong on players who might not have had the perfect football background, that they’ve had to work hard to get to where they are. “And everyone knows about Burnley, and that I like those type of players, who’ve really had to put the work in to learn their trade and profession, not always at the top level. Southgate has beena regular at Turf Moor over the last couple of years – and beyond, in his time as England Under 21s chief. And five Clarets have been capped in Dyche’s time in charge, with Trippier and Danny Ings subsequently going on to win their first caps. Tarkowski started the 1-1 draw with Italy at Wembley in March – playing on the left of Southgate’s back three – before a nagging groin problem required surgery ahead of the finals. Trippier’s success, meanwhile, has come as no surprise to Dyche. One of the leading creators of chances at the tournament, his free kick opener on Wednesday put him in a select group of England players to have scored in a World Cup semi-final, along with Sir Bobbby Charlton and Gary Lineker. Dyche said: “Tripps has had a fantastic tournament. “A few of the lads and myself keep in touch with him still, and he’s done a great job out there. “It will be a great experience as well for Popey. “But it made me laugh when the commentator (Clive Tyldesley) said Tripps may be someone people didn’t know about before the tournament – he’s played in the Premier League for four years, three with Spurs!